1. You follow the pattern set forth in the New Testament. No, the word “membership” is not found in the NT (“member” is though! ), but many of the NT Books were written to specific groups of believers who chose to identify themselves with the Lord Jesus and with one another (e.g. Ephesians, Philippians, Colossians, 1 & 2 Corinthians, etc.). 2. You have a greater opportunity to use your spiritual gifts. Every believer is given one or more spiritual gifts at the sovereign discretion of the Holy Spirit (1 Cor 12:7, 11). Yes, a believer can use those gifts without being a member of a church, but most churches limit ministry opportunities to members only, and rightly so. 3. You become a more committed part of a spiritual family. Joining a church demonstrates a (hopefully) higher level of commitment to the cause of Christ and the advancement of the Gospel. Plus, all believers need the spiritual oversight and care for their souls that faithful shepherds are supposed to provide (Heb 13:17). 4. You ensure a balanced Christian life. 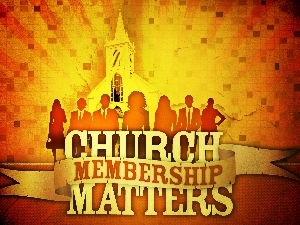 Since God ordained the church and set forth all the parameters for it to govern itself under His ultimate leadership, being a member of the right kind of church puts you in an environment that is conducive to balanced Christian growth and development. 5. You avail yourself of the wisdom of a multitude of counselors. The local church is an excellent place to receive wise counsel from the spiritual leaders and other more mature believers (Titus 2:1-8). I recommend you read Paul Tautges’ whole blog post here. And check out the comments section; some more excellent insights there.